The 5 Most Common football kicking injuries and how to prevent recognize and heal. #2 is the Groin muscle which is pulled and strained easily from kicking. The 5 Most Common Kicking Injuries and How to Prevent, Recognize & Heal! Let me preface this series of articles by saying I am NOT a Doctor and the following information does not in any way constitute a recommendation or advice by me for your individual and specific situation. This article is for informational purposes only and is based solely on my experience as a former All-American collegiate kicker turned professional kicking coach with over 9 years of coaching experience. If you have an injury that persists and is not improving, you should speak with your trainer, visit a physical therapist and quite possibly even a doctor for further consultation, proper diagnosis and a recommended solution. I hope the following information on the 5 most common kicking injuries helps you. As always feel free to drop me an e-mail or check out our website www.kickingworld.com and all our other sites like YouTube, Facebook and this Blog for everything football kicking and punting. Groin Injuries are commonly misdiagnosed for Hip Flexor injuries and vice-versa. The reason being, the two muscle areas are very close to each other on the inner portion of your leg. A pulled groin muscle typically means you did something to your ‘adductor’ or inner region of the thigh which is opposite of ‘abductor’ or outer region of the thigh. For some reason, I see more groin injuries with soccer players than I do with my kickers and punters. Possibly because the leg swing path of a kicking a soccer ball is a bit different than a football kick or punt. A groin injury can happen in anything- not necessarily just kicking a football or soccer ball, but also other athletic activities such as running, sprinting or weightlifting, to name a few. A groin injury feels very weak and painful and usually, you cannot kick at all during a groin injury. In my experience, most soccer and football related groin injuries are pulls or strains that simply require rest to heal. Follow the R.I.C.E. principle which states: Rest, Ice, Compression, Elevation. So, you would take time off from your activity, ice it (maybe 20 minute intervals a few times a day), Compress it which would mean keep it wrapped or tight, and Elevate it (so get off your feet as much as you can and lay down with your feet slightly higher than your chest) so it can take down the swelling in that muscle area. Strengthening of your ‘Core’ muscles. i.e. the Lower Abs, Oblique, Low Back, etc. (Your ‘Supporting Muscles’). Doing the above two steps will help alleviate some of the strain and pressure exerted by the groin and allow other muscle groups to help pull some weight. I also highly recommend wearing compression shorts when you kick and taking extra time to stretch your groin and hip area before you kick. The bottom line is to be smart when you train and when you kick. If you feel you are getting tired and your leg feels rubbery, weak or like you should stop kicking, then you should STOP immediately. I see too many kickers and punters who go those extra 4 or 5 balls and that is how they usually hurt themselves. Be deliberate in all you do, have a daily practice regime and be smart about your kicking/punting practices and your daily training program! Stay tuned for the #1 Most Common Kicking Injury and how to prevent, recognize & heal it! 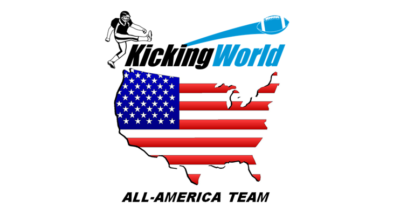 Coach Brent Grablachoff is a Professional Kicking Coach and the Owner of Kicking World. He trains Professional, Collegiate, HS & MS, and Youth football kickers and punters. He and his staff travel to over 50 camps across 22 states and also offer year-round private instruction. Coach Brent is based out of Austin, Texas.